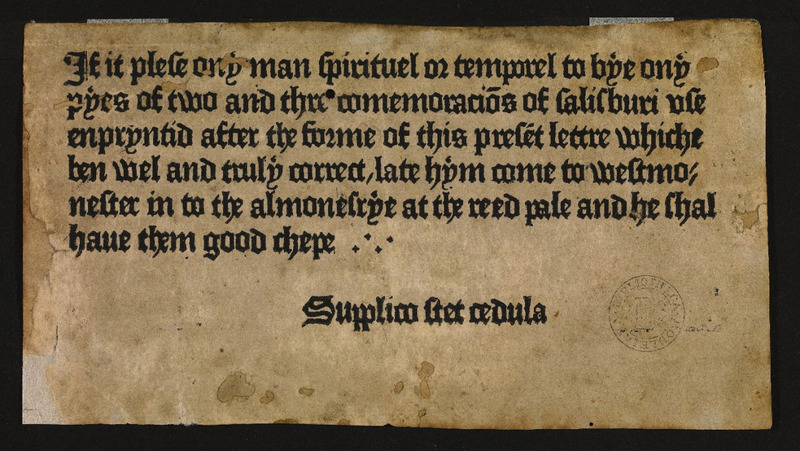 "This piece of paper, of which two copies survive, is regarded as the earliest surviving printed advertisement in the English language," writes Erik Kwakkel at medievalbooks. It states that Sarum Pie "is printed in the same letter type as the advertisement ('enpryntid after the forme of this present lettre,' line 3). Even without having seen the new book, its key feature, the type, can thus already be assessed." This pioneering advertisement also "reassures potential clients that the text of the handbook is 'truly correct' (line 4) and that it can be acquired cheaply ('he shal have them good chepe,' lines 5-6). Both features will have been welcomed by priests, the target audience, who needed their textual tools to be flawless and did not have much money to spend on them." Kwakkel also gets into other notable features of this deceptively simple-looking production, including "the precise location of Caxton’s shop," a warning in Latin urging readers not to remove the notice ("showing that it was put on display somewhere," perhaps a church porch), and even the type. In both the advertisement and Sarum Pie itself, "the letter shapes lack 'sharpness:' frequently 'blobs' and small hairlines appear as letters, while an individual letter usually has a variety of appearances when looked at in detail," possibly an attempt by the printer to create "a more 'genuine' – i.e. traditional, 'manuscript' – look." It would have been important back then to make printed books look hand-copied, since not so long before, all books were hand-copied by definition. With the first Gutenberg Bible still less than half a century old, early printers had to make sure their relatively inexpensive books didn't look like low-quality substitutes for the "real thing"; hence the assurances about both the type and the price in the text of Caxton's advertisement. That the origin of advertising turns out to be closely connected with religion may come as a surprise — though given the fact that the print revolution itself began with a Bible, a product that in either physical or digital form now practically sells itself, it may not be that big a surprise.